According to Christian tradition, as Jesus carried the cross to Calvary a woman wiped his face with her handkerchief, leaving the imprint of Christ’s features, the vera iconica, meaning “the true likeness.” When the Catholic Church canonized the woman, the Church gave her the name Saint Veronica. Medieval gardeners named the plant after her due to a perceived likeness of the flower to her handkerchief. 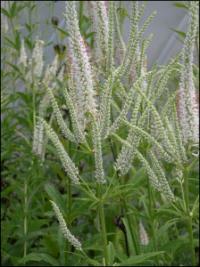 Veronicas have been in cultivation since at least Medieval times. 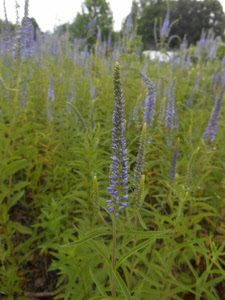 Europeans made tea from V. spicata. 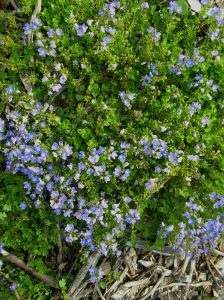 In 1693 a symmetrical garden at Versailles used speedwell. V. spicata is a parent to many hybrid cultivars. Used by American Indians as a laxative and to induce vomiting and clean blood. Cherokee cured typhus and inactive livers with Culver’s root. Remember Culver’s Little Liver pills? Seneca Indians used the root in their ceremonies. 1st collected by Rev. John Banister who moved to colonial Virginia in 1678. A gunman mistakenly shot and killed him while he collected plants. Colonial Puritan Cotton Mather unsuccessfully attempted to use this plant to cure his daughter’s tuberculosis in 1716.